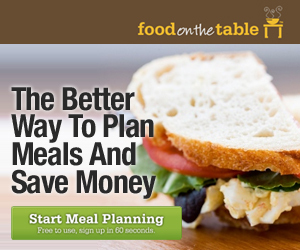 Food on the Table is a website that lets you plan your weekly menus using sale circulars and weekly ads from your local grocery stores. Now through the end of April you can sign up for FREE and get a LIFETIME premium membership for FREE as well. Sign up through this link and use the promo code SPRINGFREE good through the end of April. I signed up for this a few months ago and I love how easy it is to pick the grocery stores you shop at and see recipes using the sale items. You can even set your preferences to what you like to eat (meat free, chicken, low fat, fish) or for any allergies you may have (gluten free, no dairy, and so on). It is always nice to have a place to find new recipes and what makes it even better is that these are recipes using stuff that's on sale. My favorite!